Meet Nils & Vinnie, StoryMe's awesome Account Managers. Wondering what these guys do on a daily basis? 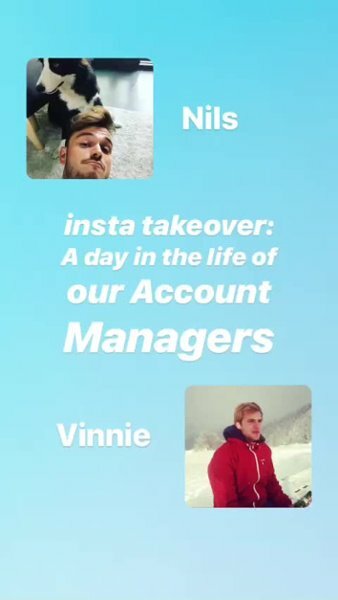 To get a look behind the scenes, we asked them to film their day through Instagram Stories and interviewed them about the perks and challenges of their job! And who knows, by the end of their story you might want to be an Account Manager yourself! Account Managers like Vinnie and Nils help existing clients figure out how video fits in the content plan of a company and its different departments. Each company has its own specific challenges, and it’s the account managers' task to meet the company’s needs with video - They’re basically the clients personal consultant for everything video! So unlike other sales profiles, Account Managers act more like partners in crime to guide a company through video transformation. What do Nils & Vinnie 💛 most about their job? Interested in joining our team of Account Managers?